WASHINGTON (CNN) - President Donald Trump released a letter he recently received from North Korean leader Kim Jong Un and praised the "great progress" in talks with Pyongyang amid signs that Kim is violating UN sanctions and little, if any, evidence of advances. The letter is dated July 6, and was given to Secretary of State Mike Pompeo's delegation to deliver to Trump while the group was in Pyongyang last week to continue talks on denuclearizing the Korean peninsula, senior administration officials tell CNN. Eager to provide evidence that talks with North Korea are yielding progress, Trump continues to say that his personal chemistry with Kim remains key to achieving diplomatic success amid growing skepticism about Pyongyang's willingness to denuclearize. In just the latest sign of difficulty, a UN Security Council diplomat told CNN on Thursday that the US submitted a report to the United Nations North Korea Security Council Sanctions Committee charging North Korea with evading UN sanctions through illegal transfers of refined petroleum at sea. In a letter Wednesday to the UN, the US asks the world body to call on all members to "exercise enhanced vigilance" against North Korean attempts to procure more petroleum supplies. 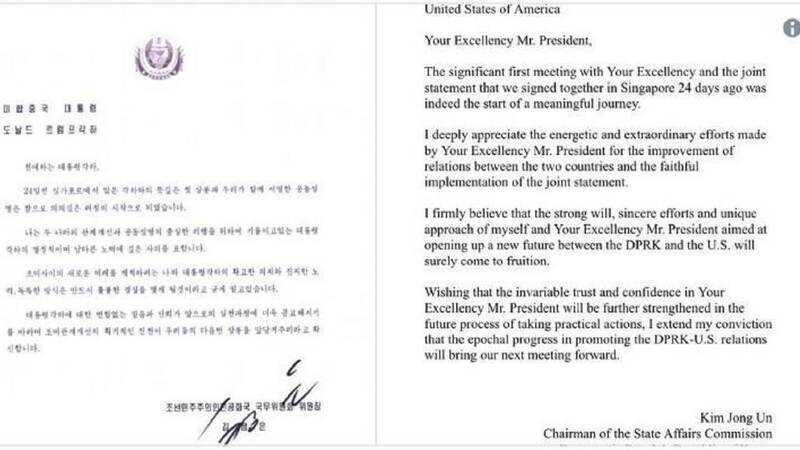 While avoiding specifics about the status of diplomatic talks between the US and North Korea, Kim's letter lavishes praise on Trump, repeatedly referring to the President as "Your Excellency." "Kim knows his mark, flattery, but note it does not use the word 'denuclearization' once," Vipin Narang, an associate professor of political science at MIT who studies nuclear proliferation, told CNN. "Kim is clearly saying, 'We will only talk nukes after we transform the relationship.'" While the letter is full of kind words about Trump, North Korean officials continue to use typical tactics to stymie talks following Pompeo's overnight visit to Pyongyang last week. Although the top US diplomat was promised a meeting with the Korean leader, Kim did not meet with Pompeo. North Korean officials did not show up to a meeting planned for Thursday to discuss the return of remains of US service members killed during the Korean War, though it is now expected to take place on Sunday, according to the State Department. Trump had held the return up as one of the successes of his June 12 summit in Singapore with Kim. "I don't know how long the Trump Kabuki dance about 'mission accomplished' on the denuclearization front can hold up given the events over the weekend and today. His strategy is now clearly 'denuclearization through denial,' or worse, 'denuclearization through delusion,'" Narang said. But one disappointing summit does not mean an end to diplomacy. Kim's letter to Trump appears to be part of a continued effort to appeal to the President directly, as North Korea did in a statement issued last week that criticized Pompeo for a "gangster-like mindset" during his visit. "Should the headwind begin to blow, it would cause great disappointment not only to the international society aspiring after global peace and security, but also to both the DPRK and the U.S.," said the statement quoting a spokesman of the Ministry of Foreign Affairs of the Democratic People's Republic of Korea. "If so, this will finally make each side seek another choice, and there is no guarantee this will not result in yet another tragedy. We still cherish our good faith in President Trump," the statement said. "I have confidence that Kim Jong Un will honor the contract we signed &, even more importantly, our handshake," he tweeted. "We agreed to the denuclearization of North Korea. China, on the other hand, may be exerting negative pressure on a deal because of our posture on Chinese Trade-Hope Not!" UN Secretary-General Antonio Guterres said the "hiccups" were inevitable. "I think hiccups in a process like this, there will be many, inevitably," the secretary-general said in remarks to reporters Thursday. "But I think there are very good possibilities for this dialogue to lead to a solution, a positive solution, aiming at a peaceful denuclearization of the Korean Peninsula." While in Brussels, Belgium for the annual NATO summit on Thursday, both Trump and Pompeo expressed confidence in the diplomatic process with North Korea. Pompeo said his counterpart Kim Yong Chol "made a commitment" that North Korea intends "to denuclearize."